Blake gets shot at family legacy in Montreal. Geoffrion, the grandson of Montreal Canadiens legend Bernie "Boom Boom" Geoffrion, was traded to the Canadiens along with forward Robert Slaney for defenseman Hal Gill and a conditional fifth-round pick on Feb. 17. He is scheduled to make his Canadiens debut on Tuesday against the Tampa Bay Lightning. After just five games with the Montreal Canadiens' minor league affiliate in Hamilton, Blake Geoffrion has been assigned to the big club. He will be available for tonight's game against the Tampa Lighting. In doing so, Geoffrion becomes the fourth member of his family to suit up for the Habs and the only player in NHL history to suit up for the same team as four different generations of his family. His great grandfather, Howie Morenz is a three-time NHL MVP and the first Canadien to have his sweater retired. His grandfather, Bernie "Boom Boom" Geoffrion, was famous for his howitzer of a slap shot and his part in six championship teams in Montreal. His father, Dan, played 32 games with the team. The 24-year-old, will wear number 57, in honor of grandpa Boom Boom (5) and Morenz (7) and will have a chance to make his mark on a team his family helped make legendary. 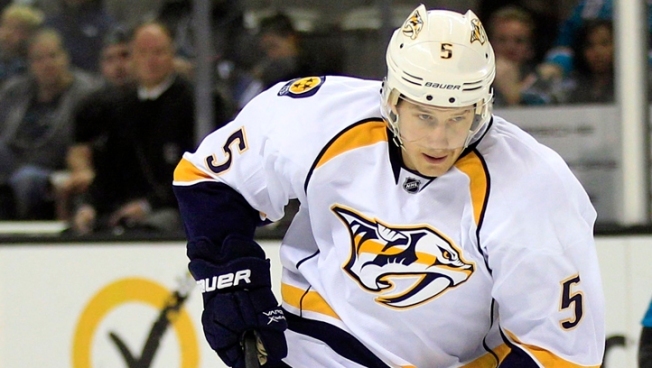 A second round pick of the Nashville Predators, Geoffrion has played only 42 games since being drafted in 2006. "When I found out that I was going to be coming here, I was really excited,” he said on the team's official web site. “Just to be able to put on this jersey is something special for me – especially being a Canadian. This is a new opportunity here for me now."